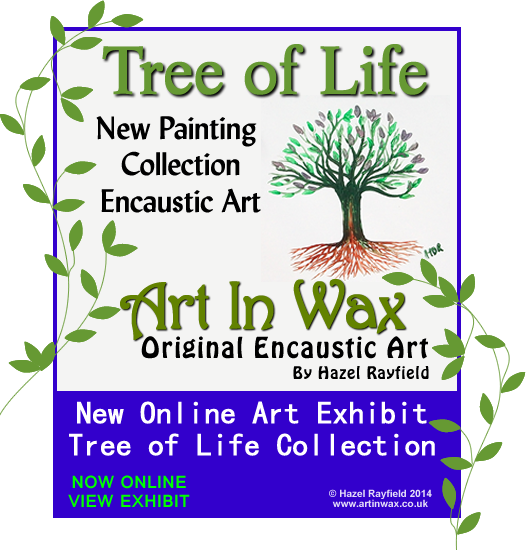 I recently painted a couple of pictures in the style of a “Tree of Life” and showed them on Facebook, they had a great response and I thought it would be fun to have a small series of these pictures featured on my website exhibits page ……. I was inspired when I painted the first picture and sent this message to my niece ….. The paintings are mostly A5 in size, the ones on a white background are painted using Encaustic hot wax on specialist gloss card, I have left the background plain to enhance the tree as the main subject. The black background paintings are on a matt black mount board and have a very different effect as they are absorbent and the wax is partly absorbed into the board, I really like this effect and have used white and silver wax on these monochrome style trees to give a wonder simmer to the leaves. The exhibit paintings are for sale please contact me for information on sizes, prices etc. What did you think of the exhibit? Please leave me a comment, I would love to hear what you think and if you enjoyed the paintings on display in this new collection. There are also several other online exhibitions that have been featured on the Art in Wax website over the past couple of years ……. I have been experimenting again with wax! This time with printed digital media and wax. I am showing the results below as I think it is good to try new things, but before you read on, I want to say that this was a fun project and one that I have had buzzing around in my head for a long time, but I have concluded that this is not a route I want to take Art In Wax – not at this time anyway. 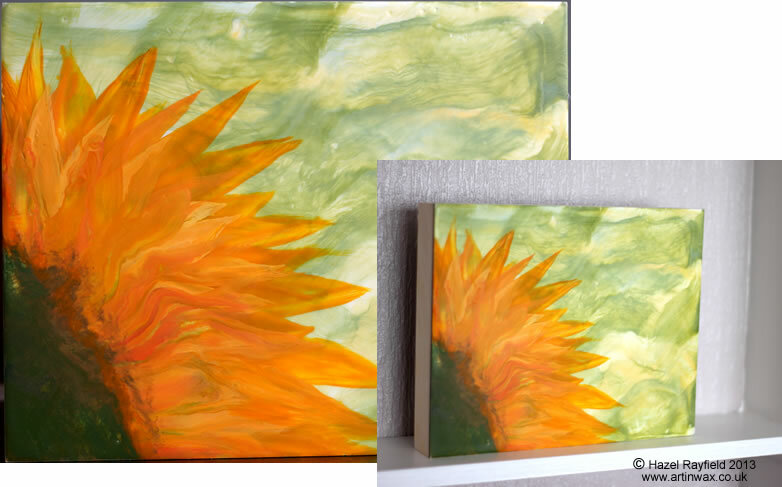 Having been a web developer and designer for many years and make digital graphics for websites and other online media, facebook banners, online shop fronts etc etc I thought it might be fun to try and join my encaustic art work with some digital graphics I created to make a mixed media style painting. I have a fondness for some of the steam punk styling that is very popular at the moment, I myself am drawn to elements of this style and have a couple of pieces of modest jewelry that reflects this trend. I especially like the clocks and cogs elements and it is from this angle I decided to experiment with. 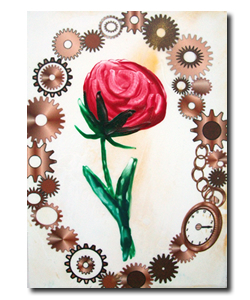 The paintings below are ACEO (3.5 x 2.5 inch small pieces of Art) and have elements created on my computer, I have put together some cogs and spokes together with some flowers and a watch and chain I drew some time ago which form the printed part of the picture, then using hot wax painted some roses and flower vines. 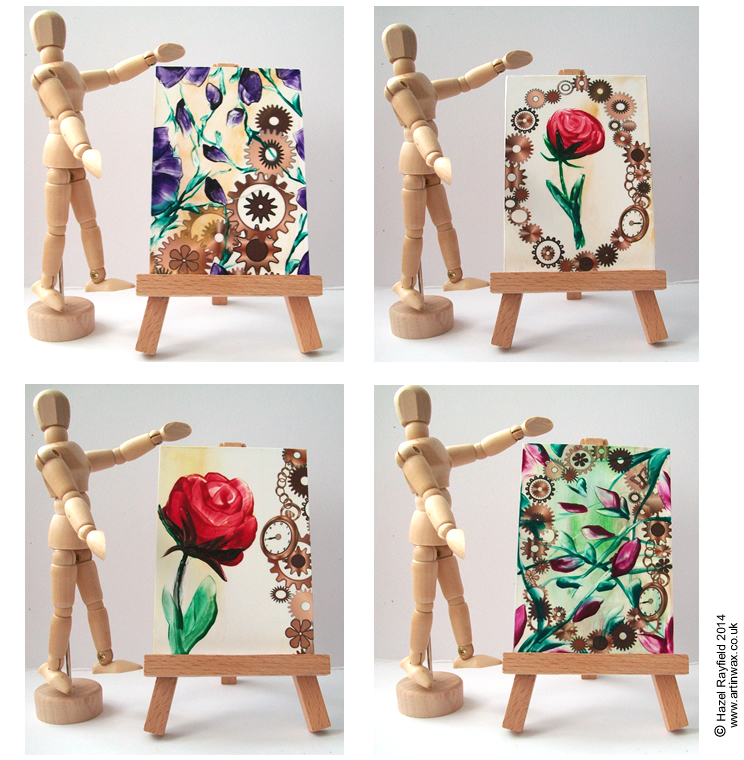 My encaustic gloss card wouldn’t print well on my printer so I have use photo paper, which is thinner than my regular painting surface, I layered clear wax over the printed parts first then added layers of wax including some gold wax then painted on the flowers and leaves in wax using my stylus ….. I have hard backed these as the paper was so thin ….. I recently looked again at the poppy painting below and decided I wasn’t as happy with it as I had been when I painted it last year, so decided to go back into the painting and add to it …… this is something I have very rarely done in the past. But as my style and way with the wax has evolved over the past couple of years I now look at some earlier pieces of Art In Wax in a new way, my paintings now, compared to 2 years ago are much more detailed and confident I feel ……. With this in mind and the great response I got to the revised Poppy Landscape painting …. it was sold 10 minutes after posting it in my folksy store, I thought I would look today and some other pictures and see if they could be improved …. below are what I have come up with : before on the right, today’s revisions on the left …… what do you think ?